Let’s say that you are managing over a 100 websites and you want to start by implementing Piwik PRO tracking code and add other features and snippets later. Now let’s say that you can do achieve this almost automatically. Sounds interesting, doesn’t it? 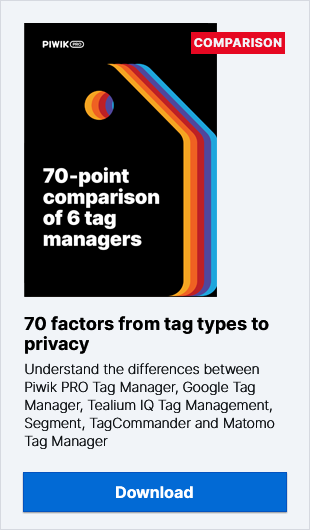 Piwik PRO Tag Manager can help you to manage all these websites in one place within one dashboard – without hardly any IT assistance. The only help you’ll need is with the initial Piwik PRO Tag Manager code. But this is only a one time job – after that all other additional code which you may want to add to your website (along with conditions to activate them) can be added using the Piwik PRO Tag Manager dashboard. But firstly you’ll want to configure the environment and set up your Piwik PRO analytics tool! Now just name the new website and leave the URL field blank. As we mentioned above, we have to put the Piwik PRO Tag Manager code into the source code of all our websites. But before doing that, it is necessary to create a container. And it is exactly this single container that all our websites will be using. The code above is only for a domain called example.com. But we have multiple domains you say. Yes and because of this, we are going to customize this code and make it even more dynamic. using a built-in Piwik PRO Tag Manager variable. Remember that on this screen we are using piwik.example.com as an example URL of the Piwik dashboard and 1 as a page ID. You will have to change it accordingly. Now create a simple trigger which will allow you to fire your new tag on all the pages of all your websites. Now we’re going to implement an additional functionality based on Piwik custom variable. Using this feature, we are going to send further information about the hostname of the page which user is visiting to Piwik. This information will be visible in the Visitor Log and can be used when custom segments. Using the same All pages trigger we saw above, save the whole configuration and publish changes by clicking the yellow Publish button. Use Page hostname while configuring the trigger to distinguish a specific domain. Use regular expressions in trigger configuration to include a larger bunch of domains. Remember that when using a trigger without conditions, the tag will be fired across all websites – great for new tools which will be used everywhere.